GitHub - selfup/hmrcmd: Crossplatform/Executable webserver in Go/Hyperapp that talks to hardware via serial port calls! Crossplatform/Executable webserver in Go/Hyperapp that talks to hardware via serial port calls! Want to be notified of new releases in selfup/hmrcmd? Portable executable webserver/client that can be run on Windows/MacOS/Linux. 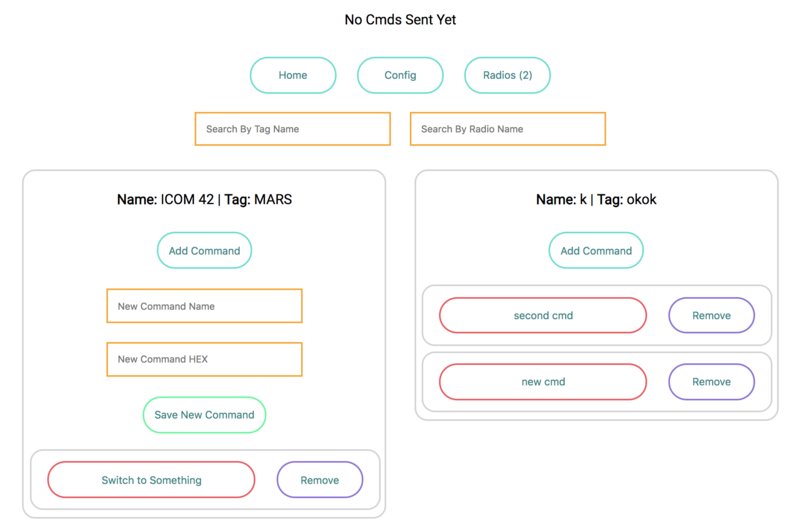 RESTful WebServer in Go that talks to radios via serial port calls. Currently ICOM is the main development focus. However you can input any SERIAL_PORT/BAUD_RATE/HEX you like, so technically anything (like sending hex to an arduino)! Please fork the project and make a Pull Request (PR) to contribute! Can make API calls when running the go server but you have to kill and reload the go server for new backend functionality. To test API calls without using the frontend there are scripts! Create a virtual port pair with com0com and then connect to one of the port pairs with RealTerm. Now make sure to send the commands to the other end of the pair! Install socat brew install socat or install the binary yourself. Install socat sudo apt install socat or install the binary yourself. Now when you make an API call make sure to use the other port in the pair. Once you send the message to 008, you will see the hexdump from 007!